Officially being one of my new favorite recipes, this Tempeh parm is crispy but baked! Perfect to make for your family or even meal prep. I love “parmesan” anything. Whether it’s eggplant, seitan, or tofu…It’s always the perfect dish! However, I decided to switch it up and try it with some Tempeh. I officially think Tempeh is my favorite way to enjoy it. It is also a great recipe to try if you want to get into Tempeh, but are not sure how to approach it. The cheese that I use is the Daiya Premium Mozzarella Cutting Board Shreds. If you haven’t had the new shreds, I highly recommend trying them. The flavor is more dairy-like and the texture is on point. They’re formulated differently compared to their original shreds and have easily become my favorite shredded Vegan cheese. 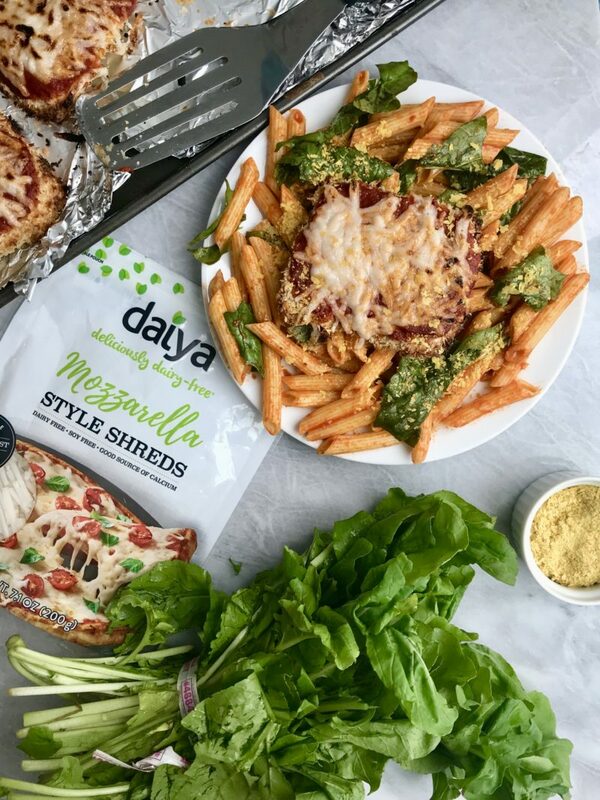 Daiya is actually the first Vegan cheese I tried almost 3 years ago! I was drawn to the fact they were nut free (however they are also gluten, soy and *obviously* dairy free). So they’re perfect with those with allergies. Always about sharing my allergy free finds! The new Cutting Board Shreds are also available in the cheddar and pepper jack flavor. 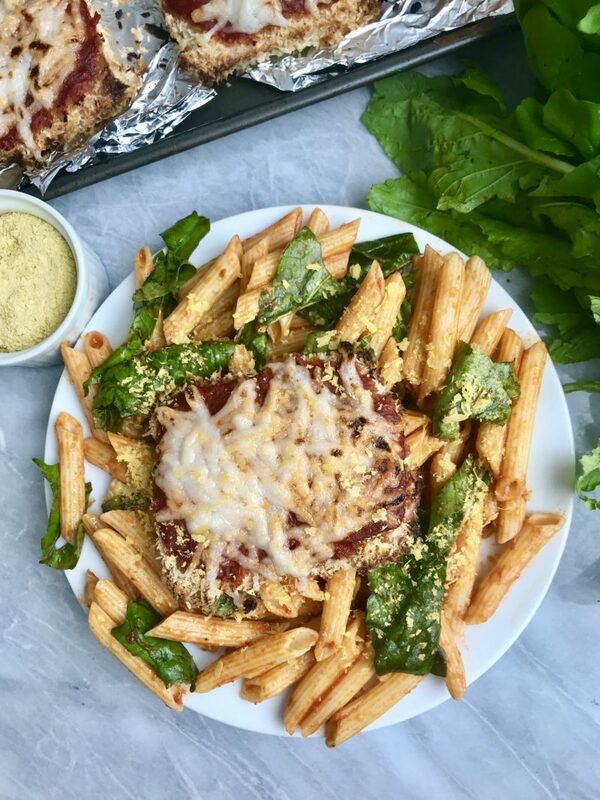 I served the tempeh parm over some pasta mixed with arugula. If you’ve followed me for awhile you would know arugula is one of my favorite greens. Especially when mixed with pasta! Slice your tempeh in half lengthwise and then cut those in half. That will give you four tempeh slabs. Combine your flour and water. Add your water gradually to create a thinner batter. You don't want this to be thick like a pancake batter but thick enough to hold onto your panko. Combine your panko, salt, pepper & italian seasonings. Begin by dipping your tempeh into your flour & water mixture, then coat in the breadcrumbs. Add to a baking sheet lined with parchment or foil (if using foil, you might want to spray some non-stick spray so the tempeh doesn't stick to the foil). Bake for 30 minutes flipping halfway. After 30 minutes, take out your tempeh. Evenly distribute your sauce and Daiya Shreds. Put your oven on broil and pop into the oven until the cheese has become bubbly and melted. 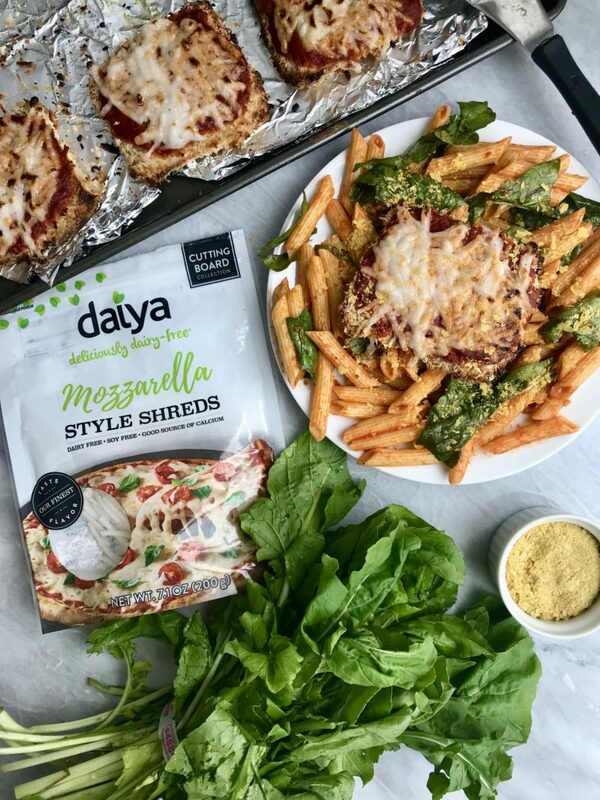 Thank you to Daiya for sponsoring this blog post. It means a lot to me to work with brands I love and who support my blog! I did it with pesto as had leftover pesto and used chao cheese. Came out delish!! Sounds delicious! So glad you enjoyed.